These new denim shorts are my fav! 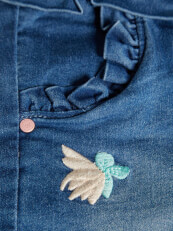 I love the frill detail around the top, it's really cute! They are super comfortable and have the perfect amount of stretch! Mom really likes that they are stretchy around the waist. It makes it easy for me to put them on and take them off all by myself!